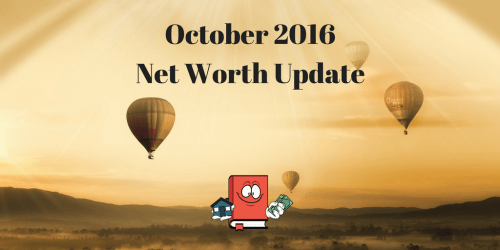 This is my official October 2017 Net Worth Update. Below are my actual numbers for ALL my investments and liabilities as of 10/31/2017. Detailed explanations and a quick summary can be found below. If you would like to see my previous months net worth posts, please visit my Net Worth Tracker. I have been tracking my net worth monthly since May 2015. If you want to learn how to track net worth then check out how I am doing it. Assets are going up and liabilities are going down. That is the name of the game folks and I am happy to report the game plan is working just right for me. Wow, it feels like a very long time since I wrote a blog post and that’s because it has been. I missed doing last month’s net worth update because I was out-of-town and was just too busy to get it done. So this month’s net worth post will reflect the last 2 month’s worth of change. I’ve also had a nice case of writer’s block for a while hence the lack of awesome knowledgeable posts on real estate investing. But no fear, I have a feeling things will pick up again soon especially because it finally got cold here in Indy. 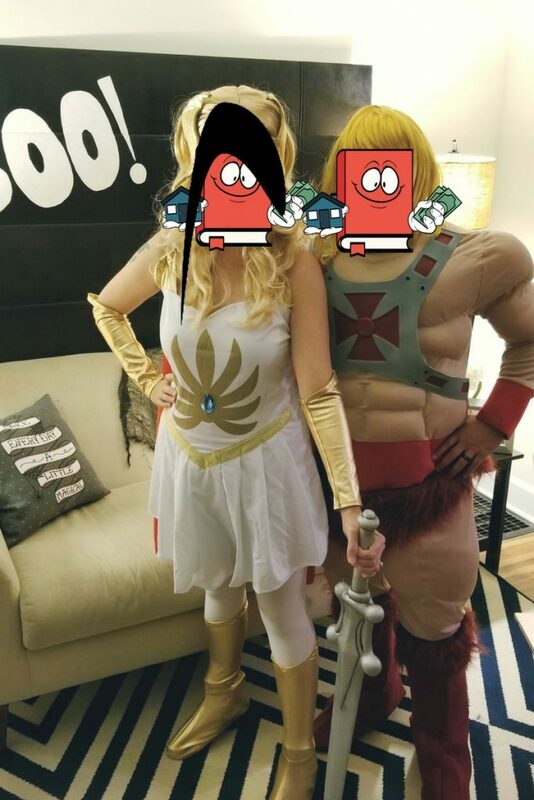 My wife and I were He-Man and She-Ra for Halloween. I grew up watching He-Man and totally freaked out when I saw the costume. I just had to get it! I HAVE THE POWERRRRR!!! We have always been into Halloween and have been doing couple costumes ever since we have been together. Good stuff as you can see in the picture! hehe! Our blogger friend Brittany from Britt & the Benjamins invited us to her Halloween bash and it was great times. She writes about personal finance and has great content. You should check it out. Real Estate Investing Update: Holy Moly I am dipping into uncharted territories now with my real estate investing now. For the past few months, I have been searching for my next fixer upper rental to add to my portfolio. I found one I really loved and put an offer on it but got outbid by another. I was bummed out about it however it led me to a new form of investing which I have never done before. Hard money lending! I am officially a hard money lender now and have made my first loan to a local investor here in Indy. As you may have noticed in my spreadsheet above, there is a new asset now for a hard money note I carry for $50k. It’s a quick 2 month max term loan secured by a property here in Indianapolis. Essentially I will make $1500 every 2 weeks in interest payments up until the full 50k is paid back to me. It’s a great way to make some quick money on money that was just sitting in my account doing nothing. Depending on the end result of this one, I may try to do another one of these. I just have to be really careful and do proper due diligence because I don’t want to get burned on something like this. I’m still new to it and in the learning process still. I saw a big decrease in my cash position because of that hard money loan I did. That was $50k I took out to invest in that however it balances out because I now have a $50k promissory note secured by a piece of property. 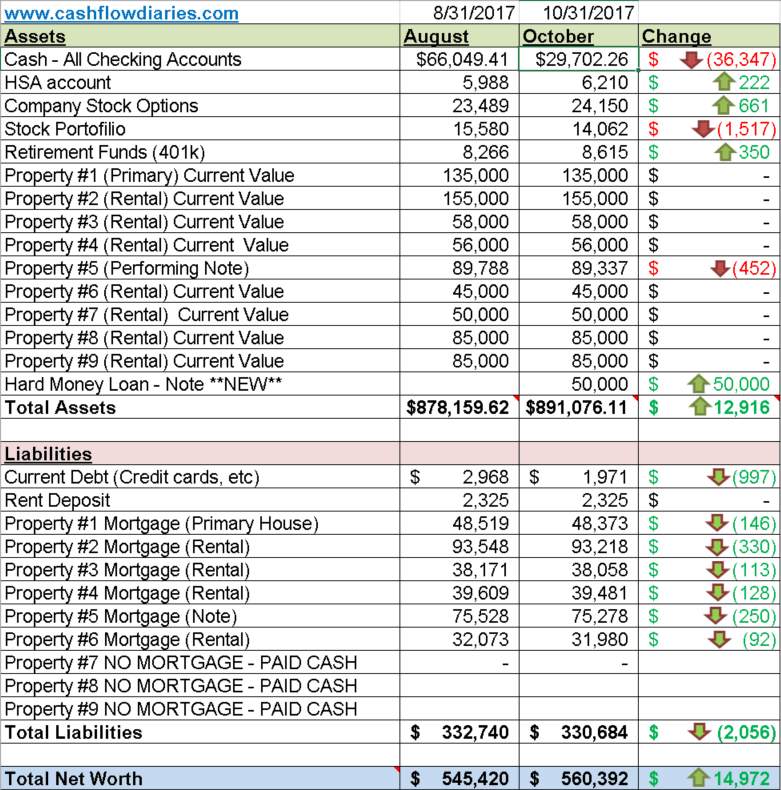 In reality, my cash reserves continue to rise each month and I would have seen about a $14k increase in cash alone since my last net worth post if I had not done that hard money loan. With my w2 income and my never-ending rent payments from my tenants each month, I typically don’t have a problem raising my cash each month unless we do a lot of spending which does happen periodically. Life is good right now! Will keep my fingers crossed that it continues in this direction. Slight increase in my HSA account from my tiny contributions I make each month through my employer. Nothing crazy. A small increase in my stock options. These are hovering at all time high’s and I am always wondering if I should cash them all out now. Since I am not hard-core pressed for cash right now though I will just let it sit there. Hopefully it will continue to grow. My stock portfolio is built of precious metal mining stocks. It has been on what seems a negative slope for months now but this is just the nature of the game for this industry. These are highly volatile and I am keeping these until the economy crashes and gold sky rockets. I’m in it for the long haul on these as I think it’s just a matter of time before the precious metal sector takes off. Overall I am still profiting from these stocks as I bought them for dirt cheap a long time ago when the precious metal sector was at its peak low. All is good with my primary residence. We are still thinking of fixing up our backyard a bit but just haven’t out of laziness and wanting to save money. We would like to build a deck and a fire pit so we can spend more time outside especially now it’s cold. That is my favorite time of the year. The only problem of course is that it cost’s a lot of money to build a deck. I may get a few quotes to see exactly how much. Rent paid early again this month which is a good thing. No repairs although I am anticipating replacing the roof on this one sometime soon. The roof is 17 years old. The tenants have been amazing to date and I will always be sure the house is in good working order for them. This is the property I self manage in Austin. Even now that I live in Indy, I will continue self managing this one. I think I can do it from afar and if in the future I realize that I can not continue being my own property manager, then I will probably just find a PM to handle it. This property was literally a cash cow for 2 years, never had any problems with it until just now. The tenant who I have never had problems with decided to not renew the lease this past month and on top of that, did not make the final rent payment. So the house is currently vacant at the moment as we look for a new tenant, I lost out on the last rent payment and it cost me about $700 so far to get the house rent ready again. The only bummer though is really just the fact that the tenant didnt make the last payment. Everything else is as expected so far with a typical vacancy turnover. This is the last turnkey rental property I purchased located in the Kansas City area. I bought this in late October 2015. I purchased this property also for CASH FLOW purposes only. I am not expecting appreciation gains on this one. Satisfied! The tenant decided to take a job in another city so the house is currently vacant and we are looking for a new qualified tenant. The good news is that the renter is fulfilling the lease terms and is continuing to pay the monthly rent until we find a new tenant. Technically, the renter is supposed to pay up until the lease is expired which isn’t until next year sometime. Luckily, his new job is covering the expenses so it’s a win win situation for everyone. This means I will have 0 days of turnover vacancy which is great. This month’s chart shows a weird blip at the end but that is only because I deducted $50k cash and then added a $50k note for the hard money loan. I love this chart though. It looks great and its nice and big. Good stuff! Congrats on the little one! I’m super excited for you guys. Thanks Tia!! Missed you at the Halloween party. Hope you had fun at fincon. Can’t wait to hear about it. Your Net Worth Updates are always crazy exciting for me to read. There’s some amazing stuff going on here and surely your readers are super impressed with how you got to where you are. I know I am. Prior to the new Hard Money Loan, I often wondered why you wouldn’t use some of your cash reserves to pay off some of the properties. You wouldn’t see a net worth change with the move, but you’d remove a liability and it’s mortgage and interest rate you are giving the bank vs. the savings rate you are making on your money sitting in the bank. I have no rental properties, so I might not be aware of some factors that you know, but I’d like to learn more on why you keep the liabilities. Once I get to the point where I am satisfied with the amount of rental properties I own, then I will definitely start paying off all the mortgages. Ah, see, I knew there were factors that I didn’t understand. Thanks for the education – that’s why I come here!!! Your reasoning makes perfect sense now. I hope to one day get into rentals, but I live in a crazy market right now (Virginia Beach) where there’s not much room for profit. I’ve been eyeing a potential city in western Virginia and a couple cities in Florida that have potential though. In the mean time, I’ll live vicariously through your rental posts. Now I’m ready for your next purchase story. I am from New Jersey and your blog helped me buying rentals in Memphis and KCMO in the past year! Memphis is doing fine so far, but KCMO has a series of hiccups, hoping it will settle soon. Anyways, thank you very much for educating me. Happy investing! Thanks Edward! Congrats on your purchases in Memphis and KC. Sorry to hear about the hiccups in KC, hopesfully it will all be worked out soon. Dont be afraid to fire the property manager if you have to. Have a good weekend! Alexander, you are killing it! I started my little blog about the same time you did, but I’ve since fallen off due to a cluster of depressing things in life. Congrats to you soon to be parents! I’m a father of two boys, 5 and 2, it’s fun. I’m in the roofing industry now and I’m learning quite a bit about the business. We are in the beginning stages of our own real estate investment empire. We live in a duplex we bought last year and currently renting out the other side. I also, do a little property management on the side for one of my old managers who owns town homes and duplexes. With the experience I’ve gain from doing a lot of the work and reading blogs such as yours, I really hope we can make it to financial independence sooner. Thanks for the awesome update, I wish you continued success to your growing family! Thanks so much! It sounds like you are doing great things now as well. It takes time to build the empire of course and you are definitely on the right track. You have a big advantage being able to work on the homes and get all that first hand experience. It will only help to grow your empire. Thanks again! Congrats to you and your wife with the baby! And awesome costumes…I loved He-Man growing up! Have you checked the value of your property in KCMO. I was surprised to see the appreciation on my house there…that market is pretty hot nowadays, though I’m sure it depends on the location. But I wouldn’t be surprised if there was some appreciation there too. Thanks Andrew! He-man was awesome, I cant believe it hasnt made a comeback yet. I would be surprised if ALL of my properties did not appreciate. I will be doing a home value check on all my properties come January. Im confident it will give me a big bump in equity. Glad to hear that life is firing well on all cylinders. To your continued success! Hey Michael! Thanks, it hasnt really hit me yet I dont think but by this time next year, life will be so different for me. Im excited about it though. Congrats on the baby news! Great stuff! Start sleeping now! Congrats on the baby news. That is extremely exciting. It will be a big change…but for the better! I like the hard money loan as well. Short term, nice interest, and well secured by the property. Sounds like a great short term use of the cash flow to me. Keep up the great work. I’ve been doing hard money loans 50k – 100k each for over 10 years. If I read your post right, you are making a 72% annual interest rate on your hard money loan?? What’s up with that, does the borrower have terrible credit history? I used to make 10-12% on these loans, but the trend has definitely been down in recent years, more like 8-11% now. Hi Joe! Yeah the hard money loan im doing is not a traditional one. Its a very unique situation in which I got lucky meeting a bigtime investor who purchased 80+ properties here in Indy and he has been spreading out the closings and purchasing them using other people’s money. Its kind of like a bridge loan I think is what its called. Its not that he has terrible credit, he just doesnt have all the cash needed to close on so many homes in this deal he got. Once all the houses are closed, this will end and I am sure I will never come across something like this again. But yes the numbers are insane so far.